Do you need an International Moving company? We are experienced in all aspects of international moving services and can assist you in every phase of your move. Precise packing and crating of the shipment is essential when shipping overseas. Our expert packers will determine exactly which items need to be crated for shipping, as well as exactly how to best prepare and pack each item specifically for an international move. All glass, mirrors and marble, along with antique furniture and any special care item, will be custom wood crated. Our experienced packing staff will build wood crates, exactly to dimension, for these exceptionally fragile items. Once your shipment is properly packed and crated, the international moving professionals at Superior Moving and Storage will cardboard-wrap all of your furniture. This is extremely important for the protection of your shipment. Certain items will also need additional protection and will be wrapped in large heavy duty bubble wrap, as an added precaution. Depending on location, we will determine the most economical way of loading the container. Shipping containers or Sea Containers come in either 20' or 40' lengths. Our professional estimators will carefully calculate the total amount of items being shipped to determine what size sea container is most efficient and cost-effective to contract. We will either dispatch the container to be loaded directly on site or, in some cases, may choose to transport your items back to our warehouse for more specific preparation and loading. Let our professional estimator determine which option would be best suited for your particular move and location. 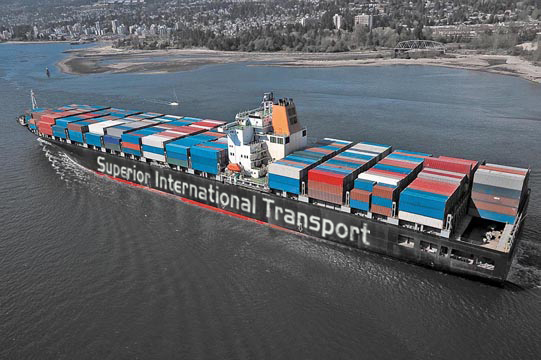 Superior Moving and Storage works closely with several shipping companies and this ensures you'll receive the best rate for overseas shipping. Our estimators will provide you with exact cost of overseas shipping. The quote will be detailed and specific, clearly indicating your precise costs for packing, crating, loading and shipping, as well as when you can expect to receive your shipment overseas.